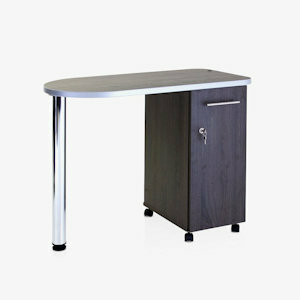 The REM Stadium Nail Station is a simple yet stylish design, proven to be sturdy and durable. Finished in the Moonlight laminate colour. It features an adjustable chrome leg for uneven floors, a lockable cupboard for extra security and internal shelf for placing your nail essentials and keeping the salon tidy. It comes on locking castors for easy movement if needed. The top surface is large and easy to clean with a mag lamp holder. Dimensions: Width 91cm, Depth 46cm, Height 76cm.This Nail Desk is available with or without an air filter (please use the drop down box to select). Dimensions: Width 91cm, Depth 46cm, Height 76cm.